Our Permanent Blackjack Tables feature top quality materials and detail-rich craftsmanship. 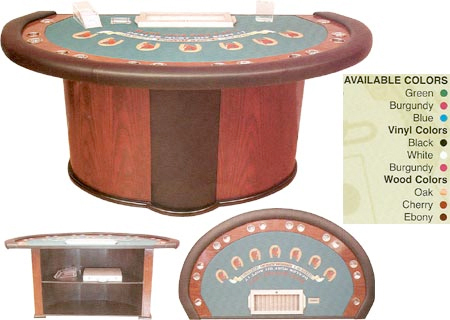 The popular "Casino Style Blackjack Table with H-Legs" has a stylish, classic look, while our "CBP-28246 Blackjack Table" features inset drink holders and a unique pillar base. Browse the tables below to find the model that best meets your preferences. This beautiful Stationary Blackjack Table (BJTB-1230) features a finished wooden base and drink holder inset, a removable padded armrest, a padded 100% wool playing surface, a built-in twelve-tube metal chip tray with a glass cover and lock, a money slot, and storage space for table accessories. Each table measures 78" x 46" x 38 high." The blackjack table weights about 150 pounds. Feel free to browse our selection of Blackjack Accessories, Insert Trays, Drink Holders, and more. For more information on our Blackjack Casino Tables, please contact us at 1-800-233-0828.